The stamp ‘On the Lake’ is a such a lovely stamp, a whole scene in itself. I featured it with a sunset behind it here keeping the stamped image all black. 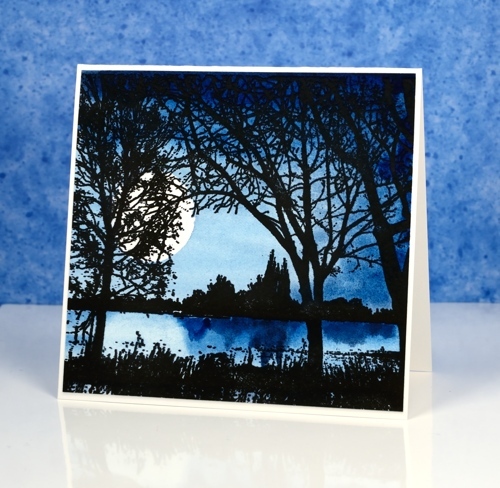 Once again I stamped in black on today’s card but used a limited blue palette to create a moonlit sky with reflections in the lake. 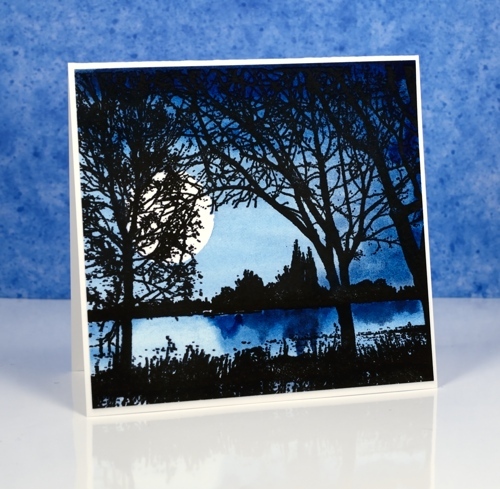 I began by using the MISTI to stamp the ‘on the lake’ image in versafine black on hot pressed watercolour paper. I used the MISTI so I could restamp a couple of times to make sure the image was solid; watercolour paper has some texture, even the hot pressed, so the first stamped image is not always complete. 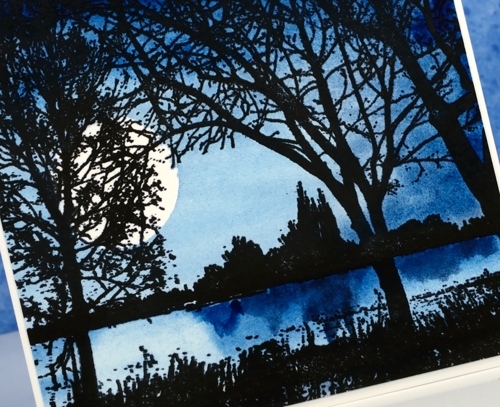 Once the the ink was dry I positioned a frisket film circle mask on the left hand side and painted the sky, lake and reflections in blue watercolour paint. I kept the colour diluted around the moon and in the lake under the moon. Another way to use this stamp is by inking sections in different colours. To see this technique check out Jill Foster’s beautiful card and video here. This is a beautiful card that seems do-able for someone with not too much experience (if very careful!!). Thank you for sharing. Gorgeous, looks like a photograph! !